People like to tell me about their digital life. Recently, I hear a lot about laptops replacing desktops. To my surprise, many are willing to spend quite a bit for this transition: most more than €1000 and some €2000 and above. All of the former assure me that the performance of their desktop replacement is "more than enough". Several of the latter actually believe that the system's performance is directly related to its pricetag. One member of this group owns a Macbook 12 (sorry for the cliché, but what can I do) and tried to convince me in a particular insistent and tenacious way that his gadget would outperform even the most powerful desktops available. In any case, my lifebook has been thoroughly smashed and humiliated: instead of the 2 minutes required by the Xeons it needed a staggering 20 minutes for the same result. The lifebook is great for writing this entry, but for serious tasks I rather turn to a serious computer. And the same applies to your Core M driven ultrabooks. At this point, the compassionate ones of the laptop owners are sure to secretly pity me. Just imagine that I have to stay all time in a kind of server room for being able to take advantage of the performance depicted above. ... how gruesome! Well, as much as I like to sit in my study, I prefer to run my computations from where I want. How do I do that? 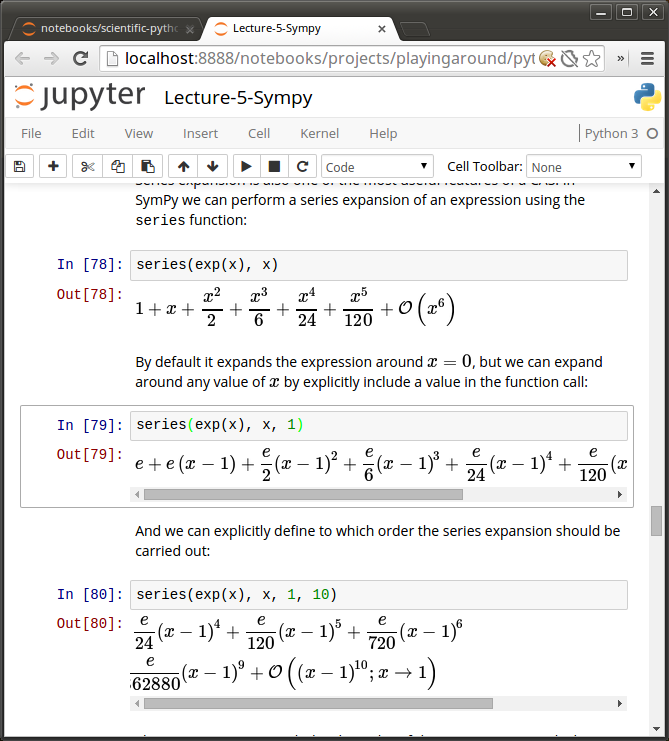 Seriously, for computations I use an ipython server running on my desktop. The posts of Fillipo and Nikolaus have helped me to find the best (most robust and convenient) way to connect to this server. For what follows, both the server and the client need to have mosh installed. For the server, tmux (which I also like to use for different reasons) is required in addition. and subsequently detach the session with Ctrl-a d.
on the client. Isn't that neat? Thanks to MathJax, the font rendering is way better than that of Mathematica. The ssh tunnel can be stopped with a single Ctrl-C on the client, the ipython server needs a double one on the server (after attaching the session again).